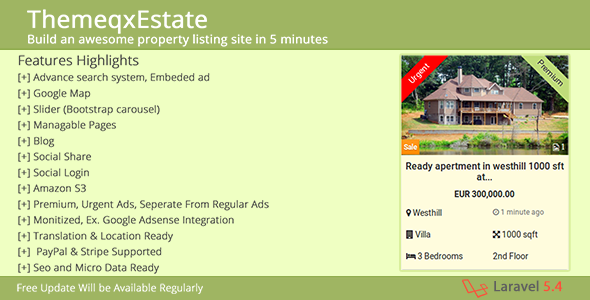 ThemeqxEstate is a larval based modern real estate property listing portal with advanced features. Its provide you a way to create a powerful, stunning website in 5 minutes. ThemeqxEstate offering you upload your files and resources to cloud with Amazon S3. Itâ€™s built-in PayPal and Stripe payment getaway help you to charge the user for premium and urgent property listing which will be more profitable for you.